Welcome mortal. This is the experimental material of Akihabara. Get ready for browser crashes and more fun. Credits for music artists are on staff rolls of each games and here. Feel scared? Go back to Light side of Akihabara for stable material! Uh-uh-uh! HTML5 is my Arcade. Opening soon. For some mystical reason you've reached this page. This means that you're ready for some more demos of Akihabara but remember: these demos are in beta so there could be some issues like browser crashing, not so nice performances and... a lot of fun! The only game that was here, Akiba Hero - a stripped down of a well known music game, on the 8 June 2010 leaved the Dark Side with the release of Safari 5, since seems that many of the bugs that kept him here were solved and making the game playable on most of the desktop browsers. For now only Firefox has some issues on getting audio position, that is 0.3 seconds in late - but is handled by the current version of Akihabara with a workaround. Luckly seems fixed for real on nightly builds of Firefox - that, sadly, suffers of other kind of issues. For mobile users. Audio on iPhone with 3.x firmware is not working so is quite unuseful to play... well... a music game. The only Safari Mobile with (limited) audio support is in the 3.6 version of the firmware, i.e. on iPad, but performances are quite low. I suggest you to try to play Akiba Hero with disabled screen zoom, clicking this alternate link. Obviously playing this kind of game with a keyboard could be painful, expecially if the default keys are, from the green fret to the orange fret, the A button, the B button, the C button, the Left arrow key and the Right arrow key (Up and Down for the pick). I suggest you to remap the keys here like this or to try the classic Frets On Fire setup or, better, to use your Wii's plastic guitar instead. Akiba Hero plastic controller. Not bundled. 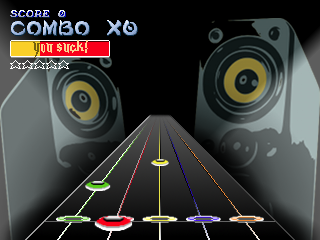 First of all, let's have a look to the final product: you (or me, in this case) playing Akiba Hero using the Nintendo Wii's Guitar controller on a Mac, saying a lot of stupid things about Guitar Hero and HTML5. Saying the truth, you should be able to play on any platform using the right combination of software/OS but, for now, I'll explain how to make this work on your MacOsX machine. 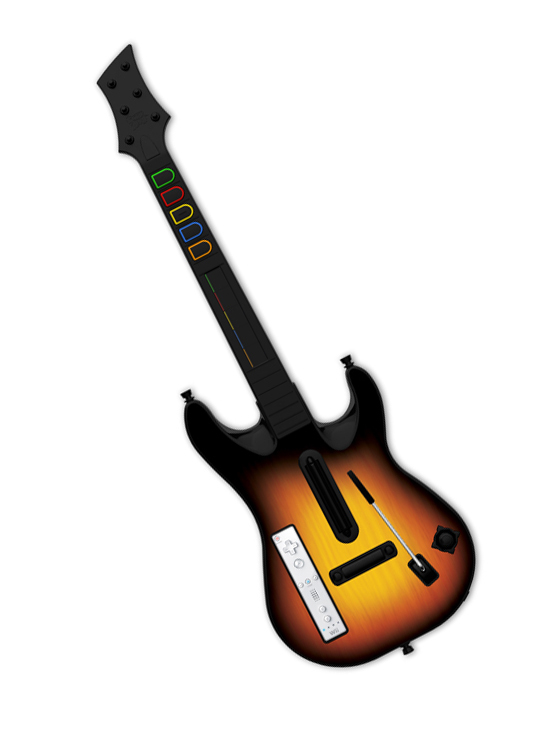 First of all you obviously need a Wii's Guitar Hero controller with a Wiimote in it. Something like this. 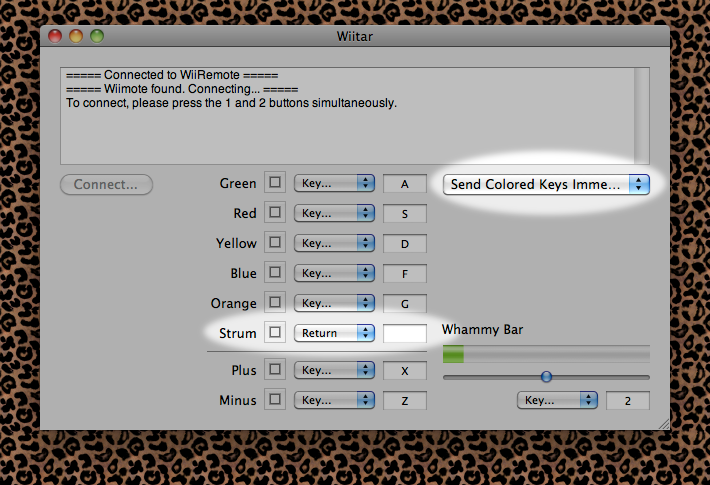 Now you need Wiitar, that converts Wii's Gutar Hero controller inputs to keypresses. Download and install as usual. Run Wiitar and hit the 1+2 buttons on the Wiimote. The Wiimote will link to your Mac. If fails, close and reopen Wiitar. Configure Wiitar like this. Check the lighter areas, that are the options I've changed. Leoparded wallpaper suggested by someone that wants to stay anonymous. Then, configure Akihabara's keyboard settings here like this. Well, I've changed all the keys! Remember to save the settings after the changes. Profit! Use the orange/blue frets for moving up and down the menu's options and the green one for confirm. If is not working, try to click on the upper side of the screen with the mouse and then on the small dashed box.